I decided to read another one of the tiny little Penguin Classics. 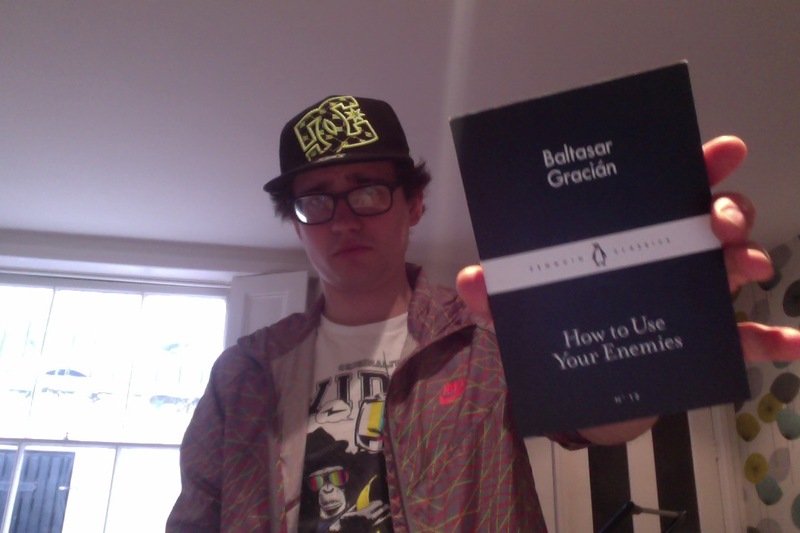 This one, How To Use Your Enemies by Baltasar Gracián, I enjoyed far more than the dulldulldull Boccaccio I read last month. Gracián was a priest, and this is a selection of maxims taken from a longer work he published in 1647, which appears to be a wide-reaching and all-encompassing guide to life. The maxims collected here all deal with relations with other people. How to gain power, how to maintain power and how to be loved and respected and depended on in each interaction one faces. In many ways it is similar to Machiavelli’s The Prince, but the obvious difference is that this is a guide to peace, whereas the other is a guide to war. It offers suggestions for methods of manipulation, it emphasises the importance of not over-sharing, how necessary and fulfilling friendships are, and how borderline impossible it is for anyone to live outside of society. I found all the priest’s points relevant to life, and felt that a lot of them were things I had grown to learn during adulthood. Perhaps if I’d read this a decade ago I’d be at the point in life where I am now far sooner, but it felt very reassuring to see ideas I’ve internalised written down in front of me, advising me to do things that I have been doing. The importance of kindness, the importance of not holding grudges, the importance of adapting ones conversation to whoever you’re speaking with, the importance of knowing ones weaknesses and how to fix/get around them, the importance of knowing who to trust and being able to rely on people, and the importance of people relying on you. It reiterated to me the value of being truthful, it phrased notions of gentle manipulation in a tone that allowed them to be both justified and appropriate to a good existence. It makes clear the importance of enjoying life, of doing difficult tasks well and efficiently, of remaining calm, of not over-talking, of being quick and sharp and smart and adaptable. It emphasised the importance of joining in with the world around the self, but acknowledged too the pleasure that can be found being alone when resting, reading, thinking. I wouldn’t call myself a Renaissance Man*, but it appears I do have a Renaissance (well, Baroque) moral temperament. This is more evidence of my Catholic mind, I feel. I think, like Gracián, that it is important to be “good”, though I think so less for reasons of faith than I do because I feel it makes everything easier. If you make no enemies, no one will stab you in the dark – if you are nice to people, 90% of the time they will be nice in return. And if they’re not, be detached enough to feel no pain. Often I scoff at the deeply selfish, at people who think nicety is a sign of weakness. I am nice by choice, as are most nice people. It is far easier to snap in anger and follow every impulse than it is to not do so. Believe me. Gracián shares my approach, my attitude, towards life, and that may mean that I’m 350 years out of date, or it may mean that to have a pleasant existence has always been the same. Get on with everyone you encounter, work hard, but also relax, have friends, think and exercise the mind. Don’t be malicious, do be kind, careful and calm. It’s a useful guide, really, and I think many others would benefit from reading it. How To Use Your Enemies costs 80p and is 50 pages long. Go learn something and live better. * I don’t like sonnets, can’t paint or sculpt and my linguistic skills extend only as far as wobbly Spanish.